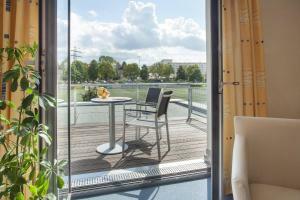 The Novum Hamburger Sporthotel is located in Hamburg, offering free WiFi, a restaurant, a garden terrace and a bar. Each room here will provide you with a TV, a terrace and a seating area. Featuring a shower, private bathroom also comes with a hairdryer. You can enjoy garden view from the room. Other facilities offered at the property include a shared lounge, a ticket service and a tour desk. An array of activities can be enjoyed on site or in the surroundings, including cycling and hiking. The hotel is 8.4 km from Hamburg Central Station, 9.1 km from Mönckebergstraße and 9.2 km from Speicherstadt. Hamburg Airport is only 10 km away.